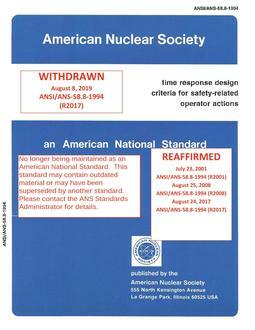 The scope of this standard is to establish the physical protection criteria for systems and components important to safety in nuclear power generating stations that are either light water moderated and cooled (LWR) or graphite moderated and gas cooled (HTGR). 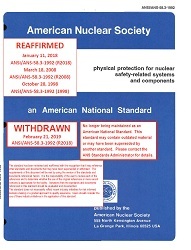 This standard is also generally applicable to other reactor types. Included in the scope of this standard is an identification of potential hazards to systems and components important to safety, and an acceptable means of insuring the protection of this equipment from the hazards: (1) Criteria. Criteria for which systems need protection are presented in Section 4, Protection Criteria. Criteria for when protection is not needed are given in Section 6, Assessment of Need for Protection. (2) Guidance. Guidance and information useful to a designer who is faced with protecting systems and components from hazards are presented in: Section 3, Design Approach for Providing Potection; Section 5, Plant Hazards; Section 7, Protection Methods; and Section 8, Implementation of Protection Methods. The tutorial nature of some of the material in these sections reflects a desire to bring some important thoughts to the attention of the designer. The designer must implement the requirements of this standard through the use of other, more detailed standards. For example, guidance to define one such hazard, namely missiles, and to determine the actual recommendations for protection against missiles, has been formulated and exists in draft form. This may require further consideration of fluid jets and pipe rupture whip, guidance for which have been formulated and exist in draft form.